Ginger & Garlic: Edible Christmas fruit tree and a wish for a very Happy Holidays! Every year around this time the same question starts popping up into my mind: what should I make for the holiday gatherings? I think everyone has atleast a few dashing staple stars; these are the dishes that you can whip up with no worries at-all, with very less preparation and they are sure to please every tummy! I am always awed by all the fellow food-bloggers who whip up these delightfully scrumptious baked goodies; seeing the pictures of which make me wish I had more of a baking woo-doo :) But with my limited baking talent all I feel comfortable taking to any holiday gatherings is usually a banana nut bread or some fruit cake! Recipe source: multiple truffle posts mainly Yasmeen's post, an old Joy-of-Baking article describing anatomy of a truffle and a step-by-step photo post from here. (The posts linked above have a much detailed description of the method, but here is what I did in a nutshell). Cut the chocolate into as many thin pieces as possible. My chocolate slab was very thick and so I chopped it very roughly into big pieces. Heat the cream just until the boiling point. Add espresso and mix well. Pour the cream over the chocolate pieces and let it stand for a minute. At this time if your chocolate was very finely chopped then the cream will be able to melt the chocolate. If instead you had big chocolate chunks like mine, you will need a double-boiler method to melt the chocolate. For double boiler method: heat water in a large pan to barely simmering. Place the pan holding the chocolates and cream over the simmering water and continue stirring until the entire chocolate is melted. Add vanilla extract to the melted chocolate and mix it really well to get a smooth consistency. This is your ganache, cover and let it chill in refrigerator for overnight. 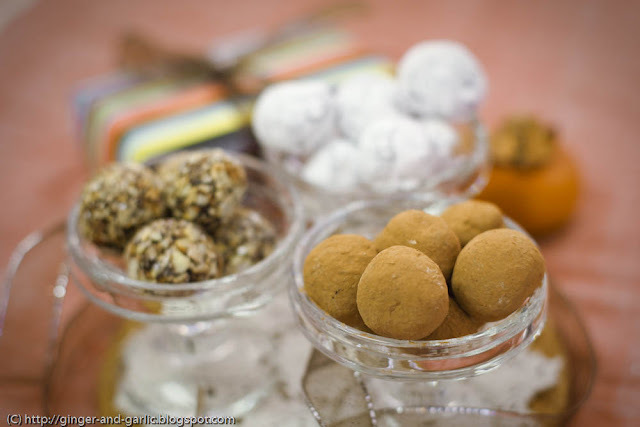 Remove from fridge when you are ready to make truffles. Place each of the coating ingredients in a separate plate. Using a mellon scooper scoop out a chocolate bowl. Roll in your hands for a smoother round shape. (Heat from your hand will start to melt the chocolate making it easy to reform into a round ball). Roll the chocolate balls in one of the coating plates making sure the truffle is thoroughly coated. Place the truffle on a parchment paper. Ready to serve! 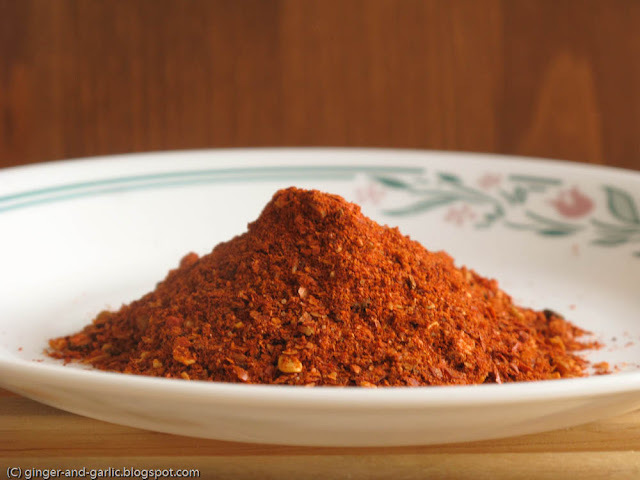 Serve them at room temperature or refrigerate for later use. Note: Since many people asked me how this tree was made I am updating this post with the instructions on how you can make an edible tree like this one! 1 styrofoam cone (small or medium size) from your local craft store. (I got mine from Michaels or something like this). My styrofoam cone was green in color, if you only have a white one then I suppose you could drape some green paper on a white cone or attach fruits very densely so it resembles more like a tree trunk. They sure look delicious and skilfully made. 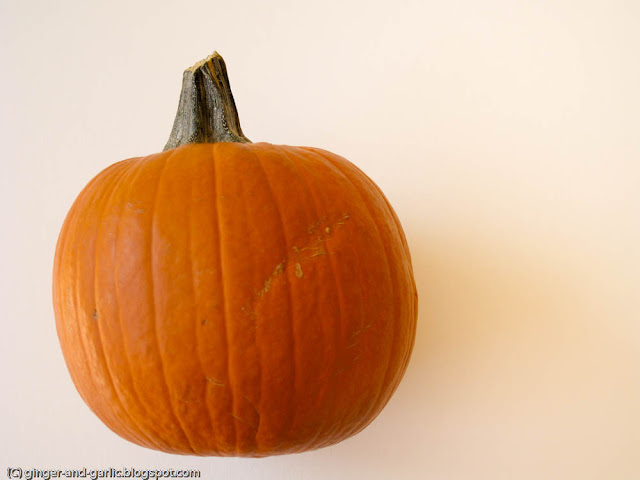 Just the thing for the season. aha.. my favorite truffles! nice pictures, PJ. You are so creative. Thanks for sharing such a beautiful recipes. beautiful truffles, Im sure most back home are brought up on laddus :-) and an awesome fruit tree!!!! I too have a fruit arrangement which i had taken for a friend!! That edible fruit tree is the most gorgeous thing. How creative you are! The truffles look fantastic too. Sonia, thanks :) you are too kind! The fruit tree has a green styrofoam cone (sold at most craft stores) as the base and then I inserted a lot of toothpicks into it and attached fruits to the toothpicks. Then there are some melon pieces cut-out using cookie cutters for decoration. I found this really cute gingerman-shaped cookie cutter that I used for a more Christmas-tree like effects, but I don't think thats discernible in the photo :) I am so glad you liked it though! Nupur, thanks :) I am sooo glad you liked it! Oh the truffles look perfect, certainly the best kind of holiday goodie,considering how much we love chocolate.The edible tree also makes an awesome treat.You have a very happy holidays.hugs! Yasmeen, thanks :) truffles was a very good recipe that you provided! Sonia, thanks so much for stopping by again :) I am taking pointers from your photos and compositions all this while! Thats such a beautiful tree and the most gorgeous truffles!!! Mwaaah...thanks girl..they look ooooohhh delectable...and i just LOVED the fruit tree..such a lovely idea! Whooo, the picture looks adorable...sets one's mood into holidays:) Lovely creation, dear. Miri, thanks :) I am so glad you liked the tree and the truffles! s, you are most welcome! thanks so much for giving me the award :) You deserve a box full of chocolate truffles! Malar, thanks! 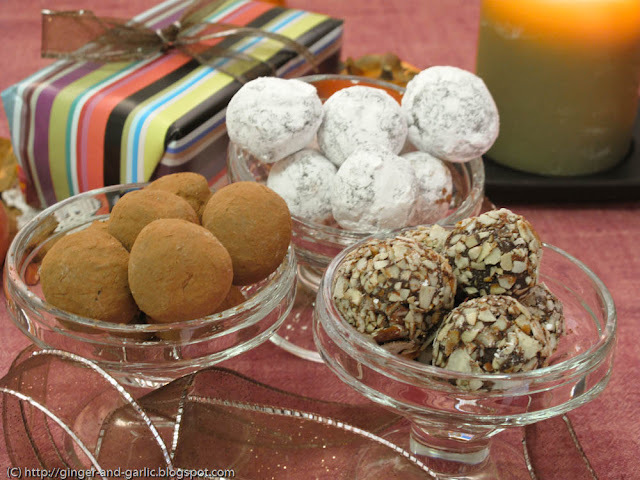 These truffles are perfect for the season :) Thanks so much for sharing an award with me! Wow... Fantastic...Perfect way to celebrate the holidays...truffles have come out so perfect for you :-)Wish you too a wonderful holiday season !!!!! Truffle looks absolutely delicious, love your fruit tree as well. Wow, PJ , I'm falling in love with your beautiful fruit tree. YOu are so creative. Absolutely love your Chocolate truffles. Delectable and Irresistible.!!! Absolutely stunning presentation. Happy Holidays. The truffles looks delicious and the tree is a visual trat!fabulous! Dolly, thanks :) I am so glad you liked the fruit tree and the truffles. The tree was real easy to make and best of all you get to eat your Christmas decoration :D Happy holidays to you too, dear! Madhuli, thanks :) I am so glad you enjoyed the tree and the truffles! Sushma, the truffles were a delight! With creamy chocolate and cream ganache they had a wonderful bite, not too soft and not too crumbly. I hope you try it sometime :) thanks for stopping by! PJ, wow your tree is looking so wonderful and so are the laddos..:)..first time here and loved checking your posts..must say they all look fab..
excellent variety, excellent presentation and the best part the fruitilicious christmas tree :). Beautiful. Thanks for stopping by and your wonderful comments :)Merry Christmas. Padhu, thanks a lot for stopping by and dropping a line! Your blog is wonderful, I'll be sure to visit it often! Deepa, thanks! I am so glad you liked the fruit tree :) It was fun making it! 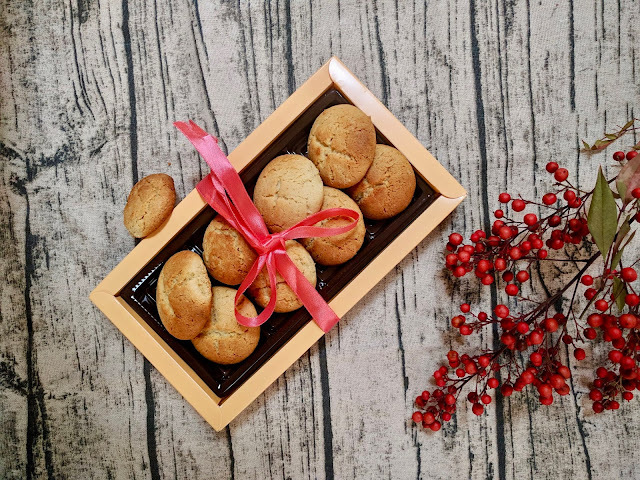 These look delicious, just perfect for the holiday season. Thanks 4 visiting, what a discovery I made here. U ve a impressive space. The tree and truffle got a professional touch. Happy Holidays! Rekha, thanks :) I am glad you liked them! your picture look great ...marvelous..
the edible fruit tree looks so colorful n inviting !! 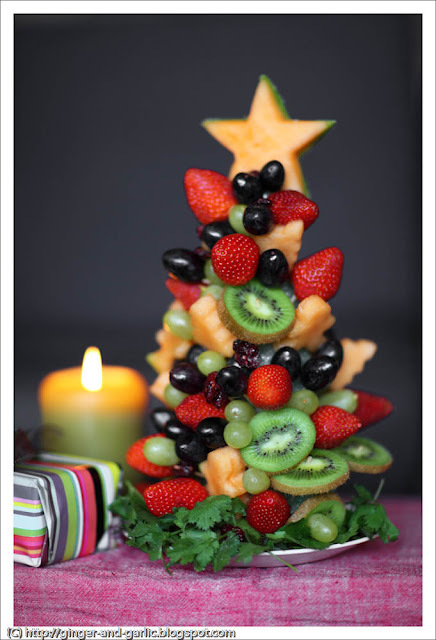 Love the fruity tree..so creative! Siddhi, welcome to my blog! I am so glad you liked my recipes and the blog! Happy holidays to you too dear! Hey..Wishing you Happy Holidays and a Happy New Year !! Hi PJ, I am drooling over the Truffles and what fruit decor. hats off to u gal. SE, thanks :) a very happy new year to you dear! Wow thats soooooooooo cute... love the fruit tree..
thanks Pavithra :) I am so glad you liked the tree. I love the fruit arrangement; that is a yumm edible tree! Preeti, thanks! I am so glad you liked this edible tree. It was fun to make! Nithya, thanks! Please do try it, it was so much fun and it looks really good as a decoration double-serving as a snack when decoration part is done :D Do let me know if you run into any issues making this, I can try to help. I love your tree! I'm going to bookmark this and give it a try next year. Very good idea! I must try it. We made one out of cupcake stand few days ago. the end of a small watermelon for the base of the tree(looks just like a tree stand) So the entire tree was made with food. Thought I'd share. brill!!!!! i think this is fantastic! i am making it for christmas!!!! A little research on google brought me here. You've made a such a fantastic job! It looks amazing. May I share the picture of the fruit tree, adding your name? Your ideas are great and I would love to recomend them to materna´s moms. THe tree looks great, afterwards would you change anything? I bought the foam and that was pricey but now I see some have made it with a pineapple to start. Awesome. I plan to make this fruit tree this year. I am in charge of making a healthy snack for my son's kindergarten class.. this will be perfect! I will substitute lollipop sticks for the toothpicks. Thanks so much for posting! Oh.. liked your site on facebook! If I make this tree the night before will it keep in the fridge? Thanks! yes - absolutely! It will keep in fridge surely for a few days. If I make this the night before, will it keep well in the fridge? Thanks. Found this on Pinterest today when looking for a fruit Christmas tree centerpiece. Totally doing this for a family get together tomorrow. Thanks so much! I linked to this post and your adorable fruit tree on my blog today, plaidfuzz.com.